I suspect that the rights Stardock bought were themselves already disputed – that is, F&P would hold that Stardock was sold something the seller did not own, while Stardock might reasonably be under a different impression. "We then contacted Atari to let them know that we were the original authors and owners of the copyright to the games and that we had not given permission for them to republish our work. Atari checked with its lawyers and wrote back confirming our claims"
Though you're right, Stardock may not have been aware of this earlier settlement when they bought the rights from Atari. However, there wouldn't even have to be a legal wrangle, since F&P's understanding has always been that the game cannot be sold "without their permission". Which means that simply getting their permission should have been enough to let Stardock sell it without argument from F&P. The fact that they haven't been given that permission means either they didn't ask, or they did, were told no, and decided to go ahead and sell it anyway (without knowing for sure if they had the rights to do so). In the meantime, F&P made it quite clear that they did not want their games distributed anywhere but GOG and what their position is. Yet even now the games sit on the Stardock store and on Steam. If Stardock respected F&P's wishes they would have pulled it from the stores until the legal wrangle can be solved (despite the fact that it might cost them money). 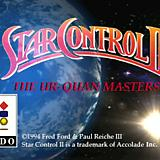 Star Control: The Ur-Quan Masters. Surely if they are such fans of Star Control then they are aware that the (free) open source remake on this site is also called "The Ur-Quan Masters"? Wouldn't that cause undue confusion in people who get recommended to look for and play "The Ur-Quan Masters"? The more I look into this, the more I'm starting to agree with Zelnick's take on Stardock's practices. The games were renamed in an effort to split the canon between 1/2, 3, and Origins. Presumably Ghosts as well, since that will be set in the Ur-Quan Masters universe. Now Star Control isn't burdened with Star Control 3 being a sequel to the the Ur-Quan story but is set in a completely different Universe altogether. 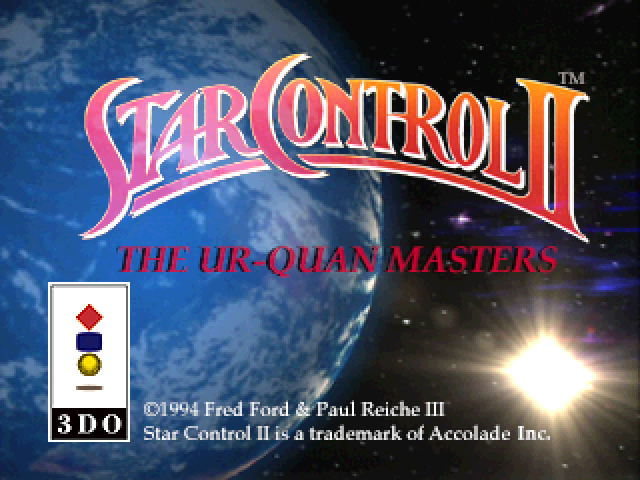 Star Control II's subtitle was always "The Ur-Quan Masters", Brad decided to drop the numbering. You'll also notice that Star Control 3 has been renamed to Star Control: The Kessari Quadrant. 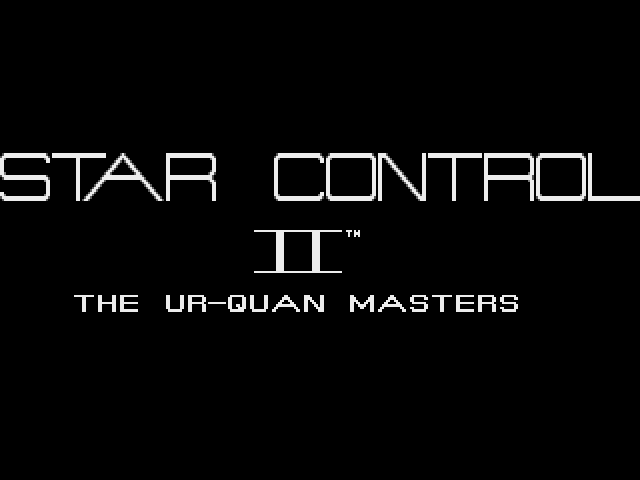 You can keep calling it Star Control 3 if you like but it is officially not in the same universe as The Ur-Quan Masters. Common sense also dictates that Paul & Fred don't hold the rights to sell the games anymore otherwise they would not be on GOG or Steam right now as per their blog post. Duly noted about the subtitle, I didn't remember that this as the original subtitle for SC2. That said, I still find it misleading - Star Control 1's subtitle isn't "The Ur-Quan Masters" and there's heaps of other subtitles they could have used instead to differentiate that 'universe' that would be less confusing. After all, they made up a new one for Star Control 3, there's nothing to stop them making up a new one for the Star Control 1+2 bundle too. One that doesn't share a name with this open-source remake. I'm not so sure. Distributors like GOG and Steam likely won't do anything if two sides (legally) disagree, which is why the games haven't been pulled. Most likely the wrangling is ongoing, and F&P's last update detailed that they'd previously argued with Atari about this in the past and won. I suspect if they lawyer up they might win again - that process just hasn't finished yet. What it boils down to is: the relationship between Stardock and F&P is not at all rosy. If it was, F&P would be giving Stardock their blessing, not fighting them tooth and nail in the legal arena. True, he could have renamed it 'The Ur-Quan Conflict', 'The Path of Now and Forever', or 'The Eternal Doctrine'. 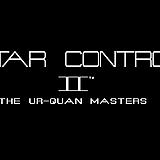 But Star Control II had 'The Ur-Quan Masters' as a subtitle first. Which is how UQM got its name. If they had kept the numbering would it have made a difference? My new speculation is that Paul or Fred don't like the idea that they have to have the IP handed back to them. Like some sort of pride issue. They can't make a new game without having their IP handed over and it's leaving a big bad taste in their mouths. That way they can win the support of their fans and make it look like they were right all along. Or it could simply be a ploy to cover up their reluctance to make a new game. Me thinks they haven't really thought it through either way. Of course it could be that nobody's out to 'get' anybody: Stardock just want to sell the games they have rights to, F&P (incorrectly) believe they have rights they don't. F&P ask Stardock for something (eg money) that they're not really owed, Stardock (naturally) refuses, F&P get upset since they're not being given something they believe they're owed. The only way it will properly get resolved is if it ends up going through proper legal proceedings, but I doubt anyone is allowed to talk about any legal proceedings while they're still going on. Or if both parties come to a mutual agreement and publicly announce the outcome. I'd still hope for the last outcome, personally. I just have to say that I am really disappointed in the smear campaign that TFB are doing against stardock. Legal business is legal business and should be left to their lawyers without making fools of yourselves in public. You don't see lawyers criticizing Fred on how he writes his code, now do thay? But perhaps that's my european mind voicing its opinion. I always have the image in my head of the blindfolding statuette holding scales. Now it appears that TFB, who I held in the highest regard for a long time, add turds to those scales in hopes of influencing them. Yeah. Why does everybody need to habe opinions about this, when we know so little. Because Paul and/or Fred started airing their bitchy rants to the public. If they would have kept to themselves and let the lawyers handle it in the first place we wouldn't be here and things would get solved without our knowing there was ever a problem. Yet, I found the tidbit they published very informative. It told us that accoding to their knowledge, GOG had two contracts, one with Atari, and one with them, in order to be able to sell the old Star Control games. Now it seems that StarDock alone has a contract with GOG. Therefore the interpretation of the contract/licensing agreement must've changed. It may be that Atari was in too much trouble to spend money on a low-value contract when they had bigger fish in the pans to go after. And that FF and PRiii did try to come to an agreement with StarDock, but for whatever reason they have not found common ground for an agreement. That's where my knowledge ends. I do not know what has been proposed by either side, and what were requirements by either side; and why these proposals and requirements did not line up to find an agreement. I love speculating, but here there isn't much to speculate on. From what I understood, StarDock wants a new agreement, that'll replace the old one, and should leave less questions open for interpretation (which in itself is a good idea). But the old contract has served FF and PR good enough, why sign a new one? It may be that putting the old games and the upcoming GotP clearances into one contract is not what FF and PR want, as maybe in their opinion they would not need a contract for GotP, and signing one guaranteeing StarDock to be free from any obligations or hinder in that regard maybe seen as leaving much room for interpretation in the future, and an acknowledgement of the need for a permission, which could backfire if someone less StarControl fanwise would acquire StarDock. According to Frogboy, StarDock owns all rights to the characters and storyline for the purpose of creating sequels. This is definitely a different stance than FF and PR have been talking about, who stated they do not need permission to continue their world. Since I do not know the words, sentences, and paragraphs of the contract, I cannot speculate who is right. At this point I think Brad might force feed the IP down P&F's throats whether they like it or not. He's trying to give it back and he's being met with nothing but hostility and lawyers. Which makes me think Paul and/or Fred don't know what they own as a legal fact or they're too proud to accept the terms. It's been so convoluted over the years I wouldn't doubt that it's the former. I didn't mean it, I just hoped he would retaliate in a worse way and you would ban him as a result (or he would leave on his own accord). Attempting to provoke someone to posting sometihing bannable (by means other than being so nice it drives them batty) is not an improvement. If the rights are in dispute, the status of the games on GOG and Steam would simply reflect their policy under such disputed circumstances. There would be no need for legal involvement if GOG and Steam's decisions were legally binding. This has already been discussed, hasn't it? If I legally own IP and you claim to own it legally instead of me, my accepting of the right to employ the IP to design a game FROM YOU is a concession that you own it. Given that the matter in dispute is the ownership of the IP, and that Paul and Fred either own part of the IP or none of it while Stardock owns part of the IP or all of it, the cost of accepting the "gift" of the IP would be conceding the entire issue currently in play. That's not swallowing your pride, especially not if you genuinely believe you have legal ownership to part of the IP, that's making a gift of the IP you own to Stardock while allowing Stardock to say that they are the ones making the gift to you. Naturally, from Stardock's perspective, they're offering Paul and Fred something, but even then, accepting the gift would curtail the legal challenge which they well could lose. So either way, claiming that it's a no-brainer for Paul and Fred and purely magnanimous for Stardock distorts the situation. What I really don't understand here is why people, none of whom have seen all the contractual paperwork (it's possible even Brad hasn't), insist that they already know the legal status of this IP. The point of bringing a case to court is to DETERMINE the legal status. It is entirely believable that Accolade concluded a legal contract with Paul and Fred which then underwent multiple modifications. Some elements of the IP may have been specifically called out as nontransferrable. Accolade has since been acquired several times; Star Control was sold off to Atari, and then Stardock acquired the property as part of a Chapter 11 bankruptcy auction. It is quite possible (even likely) that something happened in that process that violated a prior contract; if the prior contract were unclear, the violation itself might be legally disputable. Odds are extremely high that nobody with direct knowledge of the state of the original contracts with Paul and Fred was in any way involved by the time Brad was able to make the purchase. I wouldn't care to speculate as to the degree of tangle likely to be produced throughout this process, but I would be extremely surprised if there weren't irregularities or elements subject to legal challenge. Contract law is tricky at the best of times, and given that Paul and Fred were presumably uninvolved since the Accolade days, nobody would be likely to challenge the contractual convolutions. Who cared if what you did was always indisputably and clearly according to prior contract if nobody was ever going to dispute what you did anyway? When Star Control went on sale again, Paul and Fred obviously cared then. Atari might have had legal grounds to challenge their interpretation of the current IP rights, but why spend more money fighting when you could accept a small trickle of profits by sharing them? And obviously, both parties now care a great deal: Stardock has money and development time invested in the Star Control universe and a curtailment of their IP rights to it could cause them big trouble both early and late. Paul and Fred not only have to worry about their own game, but protecting their legal rights in the face of what they see as infringement by Stardock. Even in the best-case prior scenario, where Brad was in frequent communication with Paul and Fred, it would be easy enough from their perspective to see what seemed like respect and deference to be an insincere attempt to placate them while robbing them of their legal IP. From Brad's perspective, again in best-case, he had finally purchased all the IP rights he needed only to find that the legal status of that purchase was called into doubt, well after the fact and at the worst time for his new game. If Brad wanted this to go away tomorrow, he could concede all of Paul and Fred's claims and negotiate with them for any IP rights they claim which he needs for his current and future plans. From his perspective, that would be the actual gift. But while that might be the right move for a fan, is it the right move for a CEO? I well recall when the purchase first went through and there were debates about precisely which rights Atari had which it could sell to Stardock. At the time, the answers weren't always clear. The one good thing to come out of a legal case, then, will be clarity. The question is how long it takes to achieve. Narsham, I entirely understand the court thingy, but it is in my opinion not done to make such posts on dogarandkazon's blogspot site .